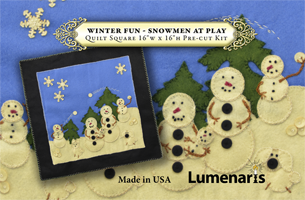 The Winter Fun series of squares depicts exciting high energy winter scenes. Each square has a coordinating color applique on top of a black felt (two layer) base. This kit features our Snowman Family at play in the snow fields of the High Sierra Mountains of California. 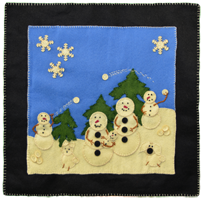 It comes complete with falling snowflakes, pine or spruce trees, the snow family (of course), a snow dog and a snow cat plus a collection of snowballs to create a little mischief. Makes a 16″ × 16″ square.